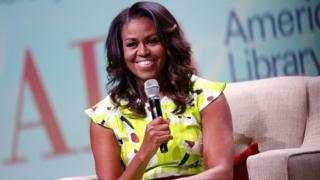 Ten of thousands of people have been disappointed trying to get tickets for an audience with Michelle Obama at London’s Royal Festival Hall. They will talk about her experiences from childhood, her work, motherhood and “her time spent at the world’s most famous address”. She will also share “life lessons learned” while hoping to “inspire people to become the very best version of themselves”. The London date is in the middle of a 13 night tour starting on 13 November in the Obama’s hometown of Chicago, where she will be in conversation with Oprah Winfrey. Tickets sold fast in the US and Obama tweeted she was “truly humbled by the response to my upcoming book tour”. They told the BBC that due to “extreme demand for this event, unfortunately there will be people who are disappointed”. A proportion of tickets went on sale yesterday for the venue’s members, with the rest going on sale to the general public at 10am today.